Flexwebhosting Review 2019: Is Flexwebhosting a Good Hosting? The Netherlands-based Flexwebhosting is a provider of an extensive range of web hosting plans on shared, VPS, and dedicated servers. Their relatively low prices make them a worthy consideration for any Dutch webmaster. Flexwebhosting has been providing web hosting solutions and related services since 2002. The company is based in the Netherlands and has now grown to a staff strength of 36 employees and a customer base of over 60,000. They expanded their services into the realm of VPS and dedicated server hosting in 2005, giving them a good amount of experience across the board. They have a large selection of plans spread across all hosting types with many managed plans and extra services available. 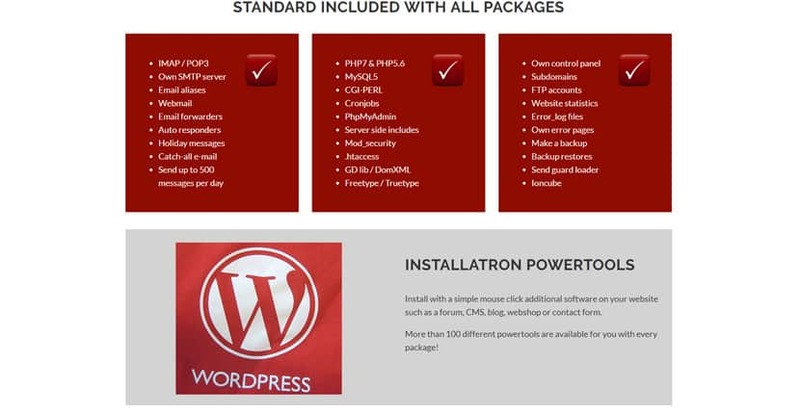 With all their web hosting products, Flexwebhosting includes the Installatron auto-installer, which comes with over 100 website applications. This is a decent range but definitely not as extensive as the cPanel and Softaculous combination. They also provide great webmail hosting with POP3/IMAP support and other features like email forwarders, autoresponders, and catch-all email accounts. Most of the background software and platforms you need are also installed, such as PHP, MySQL, CGI-Perl, cron jobs, and so on. Unfortunately, more code-savvy users may be disappointed with their lack of support for advanced scripting languages such as Python, Ruby, and Ruby on Rails. If you want a more straightforward and beginner-friendly approach to web hosting, you can also purchase their website builder with included templates and an editor, or opt for managed WordPress hosting. Linux VPS customers will get a choice between the powerful cPanel, Plesk, or DirectAdmin, while a Plesk license can be purchased for Windows. Both Windows and Linux VPS customers can choose from a number of Linux or Windows distributions. The same goes for their dedicated server products, although these also come with OpenVZ virtualization software by default to make managing your solution easier. Although Flexwebhosting has a huge selection of products covering all hosting types, they don’t offer a money back guarantee and the minimum (and only) billing period available is one year. Their prices are well within market range by European standards, but bear in mind that their packages don’t include a free domain registration and you’ll have to pay extra for an SSL certificate with most plans. Their managed services are especially affordable. You can also augment your hosting capabilities by adding on their website builder, search engine optimization services, email packages, or even their SpamExperts tool. Flexwebhosting provides flexible technical support that’s available during office hours with all of their hosting products. You can reach them via live chat, support tickets, or their phone lines. Note that you’ll only be able to access their help desk after you log in to your customer portal. Their technical support is decent and they guarantee a response of under 60 minutes with their VPS and dedicated server plans. However, keep in mind that support services are tiered for web hosting, so you’ll need to make sure you know what’s included with your plan. Their managed services also take care of most of the technicalities of hosting so you can focus on your website and business. Flexwebhosting certainly feels like they have a hosting solution at a price that’ll fit anyone’s needs and budgets. Just make sure that you’re on top of their technical support policies as well as what’s included with your plan. Wondering how Flexwebhosting stacks up against other Web Hosting companies? Enter any other Web Hosting company and we will give you a side-by-side comparison.